Zebras live up to 30 years in the wild and up to 40 years in captivity. 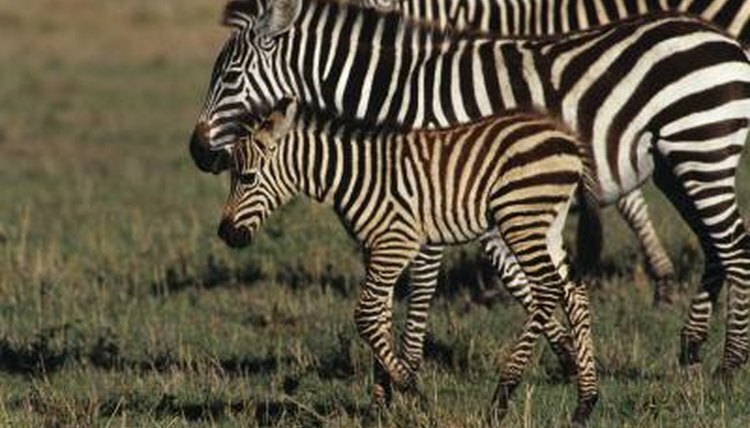 Because of the sheer amount of natural predators, zebra foals are born well developed. They can see and hear from birth, unlike many other mammals such as dogs and cats, and are capable of walking and running almost instantly, which means they are capable of following the herd if it breaks. Their life cycle is dictated by environmental and familial factors. Young zebras will stick close to their dams (mothers) for the first few weeks of their life. Dams give guidance, sometimes physically directing their foal with a firm shove; they also provide sustenance for at least the first three months of a foal's life, despite a foal's apparent independence. Zebras do not remain in the same herd for life. In fact, as soon as they’re done suckling, they’ll leave the dam's side and join the rest of the herd. But this doesn’t last for long. At around 22 months of age, they’re ready to leave the herd completely and will do so voluntarily. A young zebra will be even more inclined to leave his herd following the birth of a sibling. Once they leave the herd, zebras form loose herds with other zebras of a similar age. They may live alone, but will congregate with other individuals and herds when feeding and drinking. It is only when zebras have reached the age of sexual maturity that they fall into more solid herds. Males typically reach sexual maturity at around 3 1/2 years of age, but they rarely get to breed until around 5 years, as there are always likely to be older and more sexually dominant males around. Females reach sexual maturity at between 3 and 6 years of age. She will typically give birth once every three years and will remain reproductively active until her 24th year. Not all zebras are migratory. Their inclination to migrate depends entirely on the availability of food. If they can feed where they are and have access to water, they will lead relatively sedentary lives. However, zebras living in seasonally dry areas such as the Serengeti will migrate when their supply runs out. Since most zebra are born between November and April, non-sedentary zebras will experience their first migration at no more than six months of age, when the first dry season arrives. In predatory animals, old age typically signifies the end of usefulness in an individual. Lions will isolate an old member of the pride in order to improve the pride's hunting efficiency. However, old age in zebras is something to be respected. Since no collective effort is required for feeding, old zebras are not a burden on their herd. In fact, it is typically the oldest mare in any herd that is responsible for leading the migration. She’ll use her wisdom to ensure the herd never wanders far from water.